Action Assured - On Track and Off. Singapore, 16 July 2009 - Singapore. 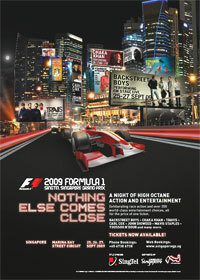 16th July 2009 - With over 200 performers strutting their stuff around the spectator areas of the Marina Bay Street Circuit, the 2009 FORMULA 1 SINGTEL SINGAPORE GRAND PRIX will leave spectators breathless as they soak in a day-andnight multi-sensory experience. Between 8pm and 10pm local time on Sunday 27th September, all attention is likely to be focused on the battle between the Brawn and Red Bull cars in the sport's only night race. On current form, Singapore looks set to play host to a championship showdown. Both before and after the race, and across the entire Grand Prix weekend, artistes led by rock band Travis, Chaka Khan, Backstreet Boys and Youssou N'Dour will add even more excitement. Large-scale theatre acts and top DJs will further ensure a weekend to remember. "We were delighted to be given so many accolades and compliments after the inaugural running of the race in 2008, but we always knew we would have to make this year's event even bigger and better" says Singapore GP Deputy Chairman Colin Syn. "With our mixture of enhanced on-track action and the ultimate music event, we are creating a must-go party for race ticketholders." Much of the post-race action for fans will, as last year be centred in the heart of the circuit. After a buzzing post-race party last year at the Padang, the top nightspot Zouk returns this time to the Esplanade Outdoor Theatre to present top deejays Carl Cox, the godfather of UK techno, and progressive tech-house' stalwart John Digweed. There will also be additional roving artistes to tease the spectators. Melbourne-based Strange Fruit will take the circuit park entertainment to another level, literally. Perched atop 4-metre high flexible poles, the troupe delivers a sublime performance, bending and swaying in the air, fusing theatre, dance and circus acts. All of the artistes will be performing at various stages around the Circuit Park. Travis will perform at Zone 4 at the Padang, while the Backstreet Boys will be playing a short acoustic set on 26 September (Saturday) in Zone 1, close to the startline. The Backstreet Boys will perform a full length set on 27 September (Sunday) at the Padang stage after the race. Chaka Khan is scheduled to perform in Zone 1 at the Paddock Club Lifestyle stage and Zone 1 stage on 27 September (Sunday) only. "When we created the Singapore Grand Prix, one of our main priorities from the start was to maximize on the entertainment and value for money for racegoers" says Colin Syn. "We want this to be much more than just another motor race in which nothing else comes even close to. With something for everyone, the 2009 FORMULA 1 SINGTEL SINGAPORE GRAND PRIX will truly be a memorable weekend like no other event on the calendar."